Aspen Santa Fe Ballet unveils the company premiere of choreographic master Jirí Kylián’s Sleepless alongside two ASFB-commissioned ballets: Alejandro Cerrudo’s emotional Silent Ghost and the energetic and infectious Huma Rojo by Cayetano Soto, choreographed on the occasion of ASFB’s 20th anniversary. Join Western music and comedy icons Riders in the Sky as they salute Roy Rogers with a family-friendly show featuring favorites like “Don’t Fence Me In” and “Happy Trails”—all wrapped up in the Riders’ two-time-Grammy-winning high yodeling style. As part of our Fall 2016 inauguration of Mark Roosevelt as seventh president of St. John’s Santa Fe, we invite the Santa Fe community to join us for a special screening of Seymour: An Introduction. Meet Seymour Bernstein: a virtuoso pianist, veteran New Yorker, and true original who gave up a successful concert career to teach music. 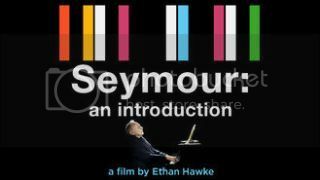 In this wonderfully warm, witty, and intimate tribute from his friend, Ethan Hawke, Seymour shares unforgettable stories from his remarkable life and eye-opening words of wisdom, as well as insightful reflections on art, creativity, and the search for fulfillment. Tickets to this event are FREE and General Admission. Santa Fe Pro Musica opens their 35th season with Revolutionaries and Romantics featuring the Santa Fe Pro Musica Orchestra with conductor Thomas O’Connor and guest cellist Joshua Roman. 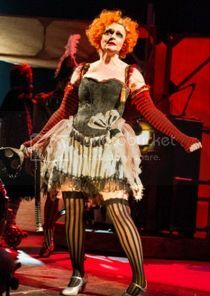 The concert includes Beethoven’s Symphony No. 7 in A Major, Op. 92, Barber’s Cello Concerto in A Minor, Op. 22 and a work by Pulitzer Prize winner and highly acclaimed contemporary composer Jennifer Higdon. Acclaimed monologist Mike Daisey ("The Agony and Ecstasy of Steve Jobs," "All the Faces of the Moon") returns to The Lensic with a hilarious, illuminating look at the "short-fingered vulgarian" who captured a nation's heart through bullying, one-syllable explosions, and occaionally telling the brutal truth: Donald J. Trump. The Lensic and National Theatre Live present "A View From The Bridge". Following its smash-hit original broadcast, the Young Vic’s “magnetic, electrifying, astonishingly bold” production of "A View from the Bridge" returns to cinemas due to audience demand. Ru Freeman is the author of the novels "A Disobedient Girl" and "On Sal Mal Lane" and is editor of the anthology Extraordinary Rendition: (American) Writers on Palestine, featuring 65 writers and poets. She blogs on literature and politics for the Huffington Post and contributes to the Asian American Literary Review. John Freeman is a critic and author and is editor of Freeman’s, a literary journal featuring new fiction by celebrated writers such as Dave Eggers, Louise Erdrich, Lydia Davis, and David Mitchell. 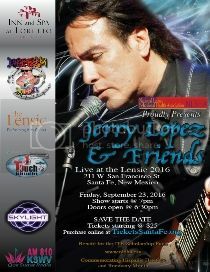 This is Special Event featuring Jerry Lopez, the 2015 Platinum Award Winner, along with his music friends performing in Santa Fe's premier performing arts center "Live at Lensic 2016" commemorating Hispanic Heritage and Recovery Month. This charitable event helps raise scholarship funds for New Mexico college students pursuing a college degree in behavioral health. Go to NLBHA.org for more information on the JTR Scholarship Fund. The Symphony’s 33rd Season begins with the rousing flash of Wagner’s “Entrance of the Gods into Valhalla” from the Ring Cycle. Virtuoso violinist Alexi Kenney returns to perform Brahms’s Violin Concerto, called by Joseph Joachim one of the four great German violin concerti. The season opener will conclude with Dvorák’s beloved “New World” Symphony, an expansive delight inspired by the sounds and sights of the American Midwest.